Ever since I spent an afternoon cuddled up with my childhood pet 'Sparky the rabbit' watching Watership Down ('Bridge Over Troubled Waters'), I've always had a soft spot for Simon and Garfunkel. I do remember wondering what all the fuss was about when'You can call me Al' reached number 4 in 1987 and everyone was saying how great these guys were, I guess I never really associated them with having performed both of these songs. Please note - I wasn't born until 1977 so the 60's literally didn't happen for me! 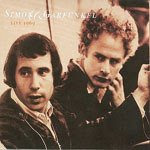 If you are also a S & G fan, you might be pleased to hear an album of their November 1969 tour (which turned out to be the duos last tour for more than a decade) was released on March 25th. Originally due for release last September, the new album has now been released as a Starbucks exclusive i.e. for now, you can only buy the album via Starbucks. Yes this is yet another twist in the music distribution model. I will discuss this further in a future blog, in the meantime, if you have any thoughts on the subject, please leave a comment.